These wonderful essays capture Hustvedt's thoughtful, intensely personal and aesthetically charged responses to art. At first, Hustvedt's choice of artists seems random or disjointed, but it becomes apparent that her work is driven by a deeper logic that unites these painters: still life, the power of dreams and the struggle to truly see the world-she finds a profound engagement with these themes in each of the artists she treats, whether it be the cityscape-bottles of Giorgio Morandi, the vertiginous monsters of Goya, the abstract masses of Joan Mitchell or Gerhard Richter's ghostly photo paintings. 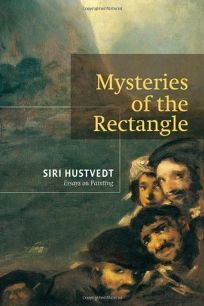 Hustvedt writes with few technical or academic trappings, and the effect is that of an intelligent, articulate art-lover speaking about paintings she has looked at and thought about for a lifetime. As with Montaigne's essays or Proust's criticism, this expository character is hard-won. Hustvedt is well versed in the theory and scholarship on these artists, something she keeps below the surface in all but the last two pieces. This delightful book will interest anyone who enjoys art, whether casually or professionally, and Hustvedt's elegant prose makes for an engrossing read even for readers unfamiliar with the art under consideration.